One mile North of Hornby, just off the A683, the earthwork remains of Castle Stede guard the crossing of the river Lune. 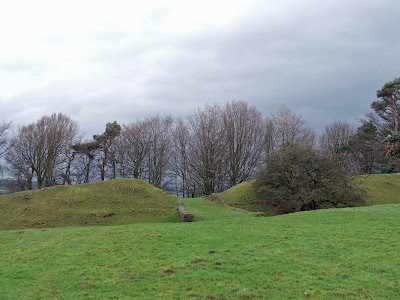 Together with motte and bailey castles to the North in Arkholme, Whittington and Kirkby Lonsdale, to the East in Melling, and to the South in Halton, this is the largest concentration of these earthwork remains to be found outside of Wales. Of these castles, Castle Stede is perhaps the largest, most complex and best preserved example in the area and even possibly in the UK. The remains are easily accessable from the road to the south of the bailey. You can park on the other side of the bridge, and walk back towards the remains. Entry is through a thin gap in the wall, a short walk up the field, and the entrance to the bailey is marked by a modern stone causeway over the ditches. The remains are thought to be from the 13th century, and overlay the remains of an iron age hill fort. From this, it's plain to see that the river crossing here was very important from the earliest of times. The motte is approached through the bailey, which is laid out to the left and right as you cross over the causeway. The earthwork ditches and banks are still very much in evidence, providing good defensive barriers against any attack. 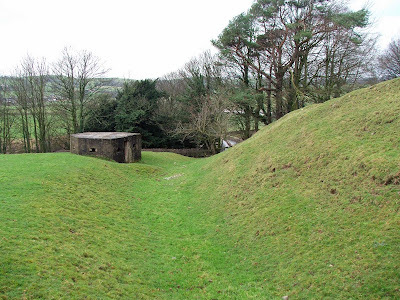 The oval shaped bailey is around 70 by 60 metres, and is surrounded by a ditch and raised bank reaching an additional height of around 2 metres in places. 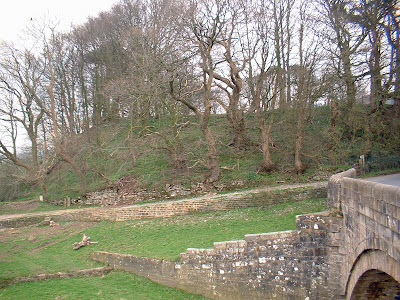 The North and West sides of the bailey are also protected by the high sided natural embankment, with the North side falling away sharply towards the river, some 4o feet below. The motte stands at the far Eastern end of the bailey, seperated by a deep ditch, some 3 metres deep. The motte itself stands to a height of around 8 metres, with a fairly flat summit of 15 metres across. The motte is fairly intact, but suffers slightly from rabbits and a few mature trees growing from the sides. The base of the motte has been walled up, probably to prevent any slippage, and this, unsightly as it is, seems to have done the trick. The motte is protected on its West, South and East sides by ditches and emmbankments, still very much in evidence. The North face of the motte decends to the river, again around 40 feet below. There is documentary evidence to suggest that the castle was in use in 1205, when it was taken from Roger de Montbegon by King John, and returned a mere three months later. There doesn't seem to be any other sites to which this documentary evidence could relate to....Hornby castle some two miles to the East wasn't built until much later. So important was the crossing here just outside Hornby, that a pill box was constructed during the second world war, no doubt designed to offer protection of the river crossing in the event of a German invasion.